Since I last wrote, I finished 2 more books. I’m still plodding through the 3rd that I took out of the library at about the same time. I need to start recording where I find out about the books I put on my to be read list so I can go back and see if my thoughts matched the ones from wherever I heard about the book. Because these past few books haven’t turned out to be favorites. First up was Those We Love Most by Lee Woodruff. “Life is good for Maura Corrigan. Married to her college sweetheart, Pete, raising three young kids with her parents nearby in her peaceful Chicago suburb, her world is secure. Then one day, in a single turn of fate, that entire world comes crashing down and everything that she thought she knew changes. Maura must learn to move forward with the weight of grief and the crushing guilt of an unforgivable secret. Pete senses a gap growing between him and his wife but finds it easier to escape to the bar with his friends than face the flaws in his marriage. Meanwhile, Maura’s parents are dealing with the fault lines in their own marriage. Charismatic Roger, who at sixty-five, is still chasing the next business deal and Margaret, a pragmatic and proud homemaker, have been married for four decades, seemingly happily. But the truth is more complicated. Like Maura, Roger has secrets of his own and when his deceptions and weaknesses are exposed, Margaret’s love and loyalty face the ultimate test. Those We Love Most chronicles how these unforgettable characters confront their choices, examine their mistakes, fight for their most valuable relationships, and ultimately find their way back to each other. It takes us deep into the heart of what makes families and marriages tick and explores a fundamental question: when the ties that bind us to those we love are strained or broken, how do we pick up the pieces?” This plot line had a lot of potential, but I felt like the author failed to reach it. There wasn’t a lot of relatable emotion in the characters. There were a few relationships that I found interesting, but overall the book was lacking for me in a lot of ways. Next up was 13 Little Blue Envelopes by Maureen Johnson. (Um, isn’t that a character in Rent??) “Inside little blue envelope 1 are $1,000 and instructions to buy a plane ticket. In envelope 2 are directions to a specific London flat. The note in envelope 3 tells Ginny: Find a starving artist. Because of envelope 4, Ginny and a playwright/thief/ bloke–about–town called Keith go to Scotland together, with somewhat disastrous–though utterly romantic–results. But will she ever see him again? Everything about Ginny will change this summer, and it’s all because of the 13 little blue envelopes.” This book was just ok for me. It was cute and the story line wasn’t bad, but it could have been a lot better. I also kept wondering if I at 17 could have traveled around Europe basically alone like Ginny did in this book, and the answer I think would be no. Plus, Ginny’s parents had no problem with this situation! If I was the editor of this book I would have requested a rewrite on most of the plot points. Hey! I got an extra book! So as it seems, I got 3 books out of 13 back that I sent out. I hope the rest have been enjoyed! I received 3 books that I’ve already read (7, 8, and 12). The rest look interesting enough! I would definitely do a swap like this again if anyone out there is interested! Finally, today I’m happy to share with you an awesome giveaway from Kelly at Sparkles and Shoes! Hi everyone, thank you so much for coming to my birthday party! 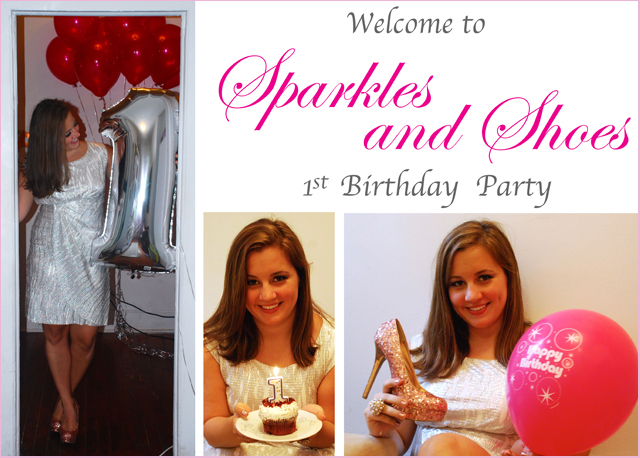 Today Sparkles and Shoes is 1 year old – I can not believe it! I still remember last summer how long and hard I pondered over choosing a blog name, deciding what to write about, and wondering if anyone besides my mom would read it – now here we are, a year later. None of this could have happened without the support of all of you, so thank you to my readers and everyone else who has supported Sparkles and Shoes! To help me celebrate I have partnered up with a great group of girls for a giveaway in honor of my birthday with hundreds in ad space, hundreds in gift cards, and half a dozen other fantastic prizes. Take a look at all of the things you can win in this giveaway! This giveaway is international, so enter away!